In 1955, 11 year old Irish girl Mary Walshe came into possession of a colourful book of letters, compiled by schoolgirls in Saarbrücken, Germany in 1946. This ‘dankebuch’ thanks the Irish people for their invaluable donations at a time of humanitarian crises after the collapse of Nazi Germany. More than 60 years later, the book passed to her husband Tony O’Herlihy, who as a loving remembrance after her death in 2011 began unravelling the mysteries behind the origins of the book, revealing a complex story about that time in history. 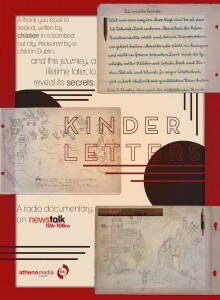 The Kinder Letters follows Tony’s highly emotional journey into the devastation of post-war Europe via modern day Dublin and Saarbrücken as he narrates this incredible story of meeting survivors of the original class, hearing first-hand recounts of the time. Historical experts such as executive editor of the documents on Irish foreign policy at the Royal Irish Academy Dr. Michael Kennedy, Irish Ambassador to Germany Michael Collins and researcher in mid-century Irish-Jewish history Dr. Kevin McCarthy reveal Ireland’s largely unspoken positive, yet at times unsavoury, position at that time, such as with the relationship between De Valera’s Ireland and Germany, and the contrasting fortunes of the German orphan children of ‘Operation Shamrock’, against that of the Jewish refugee children housed in Clonyn Castle whose admittance to Ireland had stringent conditions attached because of their religion. This documentary captures a rare glimpse of post-war Europe through the microcosm of this children’s book, and through a rich canvas of archive, music and interviews reveals Ireland’s position within Europe at a time of chaos. A short write up about the program is also available on The Independent. The Kinder Letters is an Athena Media Production for Newstalk 106 – 108fm made with the support of the BAI and the TV licence fee. All rights rest with Athena Media Ltd.